Here it finally comes! Now it’s more of a reminder of ‘PASSING THROUGH’ Palazzo Bottigella in Pavia last winter. The video is longer than usual but this time I really wanted to express the hard work that gets invested into making artworks. Often is tedious and physical work but a necessary and vital phase to materialize the vision of an idea. Some people might just like to see the final artwork as in a magic wound pop up gesture. Personally I think that the real magic lies in the process of chasing up an idea until it becomes true. The magic is the force behind the discipline invested and the commitment to pursuing a creation: a work of art. In the past year in few but heartbreaking occasions my bags have been thrown away after they had finished serving their function as art. To me it was unbelievable how a museum and couple of other places took the decision to dispose of my work even if in tatty and decaying conditions, that was actually the point from the very beginning. These incidents made a very poignant point that I find relevant to the concept of my work. It is interesting to once again notice how most people view plastic bags as the usual disposable, worthless and cumbersome object that we are impatiently waiting to get rid of. Well, here it is, this long tedious video partly shows how much time and hardship goes into making the artwork. What the video doesn’t portray is all the other more hidden phases: collection, storage, deinstalling, dissembling, drying, recycling, packing, documenting, shipping thousand of plastic bags. Of course it is much easier to get rid of them in the rubbish bin, but that is exactly the point! Fortunately I was able to reclaim all the bags used for PASSING THROUGH, not even one got wasted! Thank you Mariangela Calisti! In fact I was also able to recycled plastic pipes and metal wire. Some of the bags here in the videos have been repurposed evolved into a new life and meaning at the Musée de design et d’arts appliqués contemporains in Lausanne. Long Live my bags, I say! The Multi One Attitude Foundation is a charity dedicated to Water preservation. The Foundation aims to use sailing as a means for education and awareness of key water sustainability issues and find solutions for those key issues. The mission of the foundation is simple: bringing people together to preserve water. The Foundation aims to gather institutions, decision-makers and the general public to engage them in two essential issues around water: ocean and freshwater preservation. DID YOU KNOW ABOUT THE BO-BAG? Did you know about Petra Pan’s BO-BAG? Well if you didn’t here it is! It’s practical, arty and fun all at the same time and will also keep you hydrated! I’ve just got back from Lausanne. 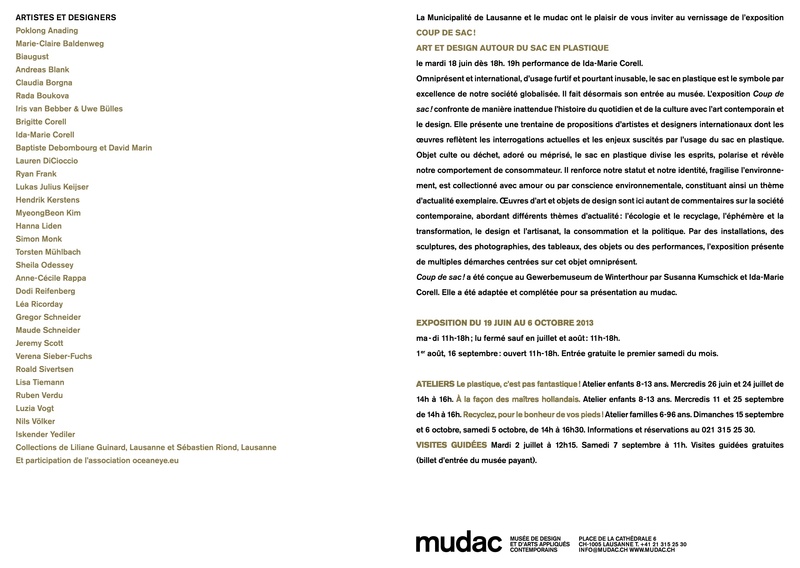 The MUDAC experience has been another beautiful Swiss one. Plastic bags of all sorts and kinds, in all forms and shapes have invaded the museum and will inhabit it until October. It was lovely to meet a new museum crew and to reunite with Wintethur’s Gewerbemuseum once again. Exactly a year later the show ‘OH! PLASTIC SACK’ has travelled to Lausanne to become ‘COUP DE SAC!’, the second art show fully dedicated solely to plastic bags! Isn’t it great? And certainly about time too! The artworks presented last year at the Gewerbemuseum have flourished at MUDAC with some great new entries! The plastic bags exhibition is now growing while creating an ideal scenario of loving reunions and exciting new acquaintances. The initial event’s inspiration was sparked by Ida Marie Corell’s ‘A L L T A G S O B J E KT P L A S T I K T Ü T E’, a book all about plastic bags, a selection of which featured ‘bagsworks’ materialized last year at the Gewerbemuseum under the curatorial-ship of Susanna Kumschick. The show keeps living and evolving thanks to a collaborative effort with MUDAC and its curatorial team led by Susanne Hilpert Stuber. And by the way before I get too carried away I would like to officially thank the wonderful technicians: Daniel, David, Benjamin, and Dominique and all the rest of the staff like Francoise, Caroline and many other wonderful people. In the meantime I am posting a selection of picks of my work which, as you know, is site-specific and therefore very different from the one created last year for the Gewerbemuseum. This time I was offered to interact with two different areas: one indoor and one outdoors. This was an opportunity to dwell in an obvious inside-outside exchange. But then again I am a big fan of the obvious and the banal! The main inspirations for the work were the museum’s ancient Egyptian collection on display in the basement, the permanent modern glass collection on the top floor and the architecture of the museum’s historic building that boasts typical Swiss features including a tower like structure. Not to mention the all-surrounding white Alps. Each of these ingredients seem to lend itself to a perfect western fairy tale. ‘RAPERONZOLO RAPERONZOLO, NON BUTTARE GIU’ IL TUO CODONZOLO!’ is the title of the work. The title is in Italian (translated from Rapunzel Rapunzel, don’t let down your hair!) and stems from the Brothers’s Grimm Rapunzel tale. Fairy tales and stories, transitions and transformations, time and vertical spaces are some of the elements with which my bags are playing with. 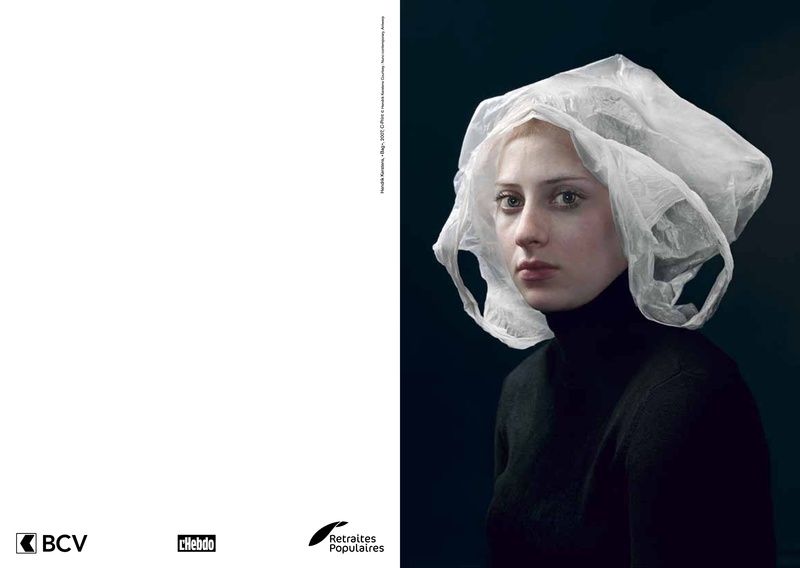 Plastic bags like hair, an extension of our bodies? Bags an appendix of nature? For this occasion the bags constitute a hairy foliage cascading like Rapunzel’s braids inside the museum whilst climbing upwards akin to rampions to form a luscious magic garden of plastic bags connecting present to past, but especially wondering about the future. Down, from the Egyptian grotto stocked with ancient craft you are elevated up to the loft: nest to a sublime glass collection. The journey is via a modern see-through glossy lift; white plastic bags will accompany you through the transition, from earth to air and from air to earth. Like in an aquarium or a greenhouse the bags floral or coral formation can be viewed from behind the glass. They are ephemeral vessels that contain our contemporary consumerist life-style. The lift is the vertical mechanism that climbs up and falls down defeating gravity with lightness whilst accentuating the circularity of the cycles all around through a dialogue with its immediate surroundings if not just with the concept of my work. Plastic bags, the banal invaders of everyday life and of nature, are now crawling inside museums only anticipating their archaeological destiny. It all started just a few floors below, there, in the Egyptian cave. Continuity, innovation and evolution are the motto of the soon to be archaeological plastic remnants. And while we are desperate to get rid of them, one day we will fret to preserve them. But right now everything is disposable. Our most precious resources: nature, off it goes, thrown out of the window. It’s easy, especially driven by an insatiable force: the search for unachievable happiness. A simple gist, a sudden action an automatic gesture: to throw. To throw away: both a transitive and intransitive verb very popular in our contemporary vocabulary. A necessary word whose significance is closely tied to western opulent abundance as much as it is an intrinsic part of the dictionary of the plenty. But throwing inevitably forecasts precipitation. In my vertical enchanted garden, plastic bags are simply moulded, just slightly, only to suggest something possibly appealing but already uncontrollably transforming, falling into the imminent next. In this case the appeasing static foliage of white bags transits from the inside to the lively outside of the museum, straight into kinetic whimsical shapes that will morph and rotten at the whims of climate changes and time. A vertical gravitational metamorphosis process that is unstoppable despite all human attempts. Once again aesthetics are only a hybrid tool, a mean and not the end of the work. Will beauty save the world? Will the prince save the princess from the tower? Will the princess save the prince from the outside world? Just like in Grimm’s fairy tale will we fall in brambles, have our hair cut off and be blinded by another illusion hopelessly waiting for a magical drop of water: a tear? What do plastic bags represent? An impossible dream of lightness? A profound superficiality? A playful illusion? Maybe we’ve cultivated plastic bags to create a fabulous garden that even nature can envy. But will there be a happy ending? From the top of tower Rapunzel is shouting for help! CHECK THIS OUT, A NEW RESIDENCY FOR ARTISTS. THIS TIME IN SCOTLAND. Six artists’ moving image residencies held in the Ettrick Valley, Scotland. Each residency is four weeks in duration and will be held from 1st to 29th October 2013. Participants will be chosen by an independent international jury of established filmmaker-artists and arts professionals. • £500 will be paid to each participant toward travel, time and materials. • An additional £400 is available for living expenses (£100 per week). • Free participation in six artists’ film and moving image master-classes. • Free accommodation in the Scottish Borders, Scotland. 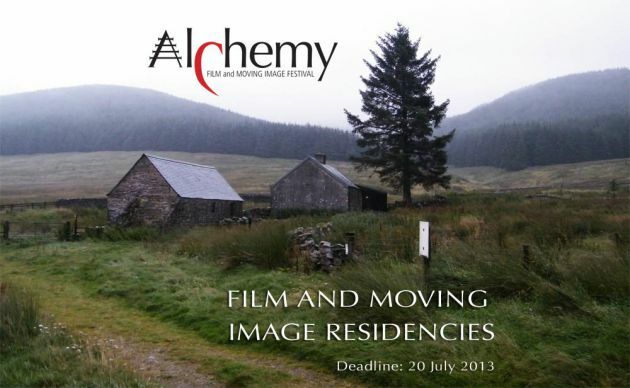 • Opportunity to show work at the 2014 Alchemy Film and Moving Image Festival. Travel to and from the residency location is the responsibility of the participant. Please read the following information before applying. The application form is at the bottom of the page. Alchemy Film and Moving Image Festival is dedicated to screening high profile experimental film and moving image works, related to an overarching theme exploring humankind’s relationship to nature in its broadest sense. Our theme for the next festival is ‘DreamLand.’ It will be held in Hawick, Scotland from 4th – 6th April 2014. The residencies will be supported by the Creative Director of the festival. Our 2013 moving image residencies are aimed at stimulating production and developing talent specifically in non-narrative or experimental artists’ film. They are supported by Creative Scotland’s Creative Futures programme. The residencies will take the form of single group residency for six artist-filmmakers, held in the Ettrick Valley in the Scottish Borders countryside in October 2013. A core component of the residency is the inclusion of several expert master-classes/Q&A seminars with artist filmmakers of international standing. The aim of these master-classes is primarily to stimulate new avenues of creative thought through the sharing of experience and skills. We aim for a residency culture of conceptual learning and development, personal reflection and experimentation. Screenings of work will precede the master-classes, and subjects covered may range from practical production techniques to conceptual development, to distribution and film festival promotion. Regular informal experimental film screenings and discussions will be held throughout the residency period. There are no fixed expectations related to the production of work, though a screening opportunity at the next Alchemy Film and Moving Image Festival will be available to residency participants who have completed work by April 2014. The residency is an opportunity to develop and reflect upon your practice, while simultaneously exploring the work and ideas of other practitioners. It will be an intensely focussed period of time in which we hope you will learn, experiment and have the freedom to take creative risks. The residencies will happen over 4 consecutive weeks in October 2013. If selected, you should plan to arrive on Tuesday 1st October and leave on Tuesday 29th October. In applying, you must be in a position to take up the residency during these specific dates. The deadline for entries is 20th July 2013. After final shortlisting we may conduct telephone / skype interviews in advance of offering of a place. Applicants will be notified of a final decision no later that 20th August 2013. • Established and early career filmmakers / moving image artists based anywhere in the world. • Artists working predominantly in another art form who possess basic skills in moving image making, but who wish to extend and enhance their moving image practice. • All applicants must provide evidence of an established body of work, preferably containing at least some moving image work. • All applicants are expected to provide their own camera/editing equipment and to possess at least a basic understanding of how to use them. • You do not need to have an arts or film qualification to apply. • In applying, you should try to highlight how your practice might benefit from this particular type of residency – its group situation, the exposure to the master-classes and its remote rural setting. We are aiming for an equitable mix of international, Scottish national and regional participants. The strength of individual applications will take priority in determining the final mix, both geographically and in terms of experience. Participants will be chosen by an independent jury of established filmmaker-artists and arts professionals. The Scottish Borders is a beautiful region of Scotland, approximately one and a half hours drive south of Edinburgh. It is a remote, exceptionally quiet and sparsely populated region, with a wide and open landscape dominated by hill farming (sheep), rivers and commercial forestry. It is a deeply historic area, once home to the infamous, lawless ‘Border Reivers’. The residencies will be situated in the remote Ettrick Valley. This valley has been a home and source of inspiration for several artists and writers – most notably the ‘Ettrick Shepherd’- James Hogg (1770 –1835). Hogg wrote the astonishing ‘Confessions of a Justified Sinner’, along with many other fine works. He was friendly with Walter Scott, who is also known to have visited the valley. In a more contemporary context, the abstract artist William Johnstone (1897–1981) lived and worked at the head of the Ettrick Valley. The painter Tom Scott (1854–1927) also lived and worked close by in the Yarrow Valley. The valley road is a dead-end road, with the wonderful Over Phawhope Bothy (pictured above) just beyond its end. This bothy has been used for several arts projects (even screenings) over the last few years. The nearest towns/shops are Selkirk (40 minutes drive) and Hawick (also 40 minutes drive), both of which have strong historic connections to the woollen mill industry, plus a strong tradition of ‘Common Ridings’. There is a limited public transport service (see the timetable) between the Ettrick Valley and the local towns (once or twice a week), for shopping and supplies. The nearest airport is Edinburgh. Glasgow and Newcastle airports are also within an accessible distance. The closest train stations are Carlisle or Edinburgh. There is a regular bus service to Hawick and Selkirk from both Carlisle and Edinburgh (2 hrs). We will coordinate pick-ups according to individual participant’s transport needs. Participants should be aware that the Scottish weather is always unpredictable and while the October weather can be beautiful, it will also be cool (though unlikely to dip below freezing in the daytime). It is often wet. Wellington boots and good waterproofs are recommended. The residencies will be held in self catering accommodation split across two traditional three-bedroom detached cottages approximately one mile apart. Both houses are situated in their own grounds within the stunning open countryside of the Ettrick Valley, ideal for walking. An independent shared studio/workspace may also be available at Ettrick School (a recently closed primary school which now houses exhibitions), a further mile away. Participants will each have their own private room and will live together in two groups of three, coming together regularly as a larger group of six over the four weeks. Bed linen and towels will be provided. Some group meals will be held (and there will be a welcome meal on the first night), but otherwise individuals will self-cater, or cook together as they wish. Participants will be responsible, collectively or individually, for buying their own food and organising their own catering. These residencies are also an opportunity to escape the tyranny of permanent connectivity. Mobile phone signals are not available anywhere in the valley. Limited internet access may be available at one of the cottages, but it is slow, sporadic and unreliable. It is a 40 minute drive to the nearest town, should you require more reliable internet access. Each participant will receive a fixed fee of £500, plus £100 per week for catering and expenses (a total of £900). The accommodation and expert seminars are provided free of charge to participants. We regret we cannot directly pay any travel expenses. Limited additional financial support may be available to help complete projects for screening at Alchemy Film and Moving Image Festival 2014. The total £900 payment will be split into two instalments, with one payment of £500 made on arrival at the residency and the second £400 payment on completion of the residency period. We are not able to supply cameras, special camera kit, lenses, lights, computers or editing equipment. We will try to help with equipment needs where possible, including directing you toward hire companies if needed. Participants are generally expected to bring their own equipment. It is important that participants are fully committed to developing their creative practice for the duration of the residency. Partners are not allowed to join participants on the residency. Very brief visits from friends, partners or family may be accepted, but only with the full agreement of the other residency participants after your arrival. We do try to discourage this, as it can break the creative dynamic of the residency experience, for yourself, and for others. Participation in the six master-classes is an important and unique aspect of this residency and attendance at these is something we hope you will want to fully engage with. Some of these may be held over Skype, on once weekly trips to the local town of Hawick. Others may be in person. If you are not interested in participating in this aspect of the residency, then this residency is probably not right for you. You can use the residency time to work together or independently. Working together with other participants is not a requirement and it is up to individual participants if they choose to engage in collaborative projects. Collaboration may naturally emerge within the group, but it is never forced. Participants are there to further their own individual creative practice and this must be respected at all times. You will be expected to be fully ‘in residence’ on-site for the majority of the four weeks, at least for no less than 24 days of the 28 day residency period. You will be expected to live harmoniously with two others, as part of a wider participant group of six. It is expected that you will respect the privacy and personal space of all other participants, while contributing your share to the tidiness and cleanliness of the house you are in. You will be expected to abide by the house rules, which include refraining from antisocial, threatening, rude, discriminatory or invasive behaviour. Please fill out the online Residency Application Form. The deadline is 20th July 2013. Applicants will be notified if successful no later that 20th August 2013. • Why you would like to participate (up to 300 words). • Any specific project ideas you would like to develop (up to 300 words). • Summary information about your practice (up to 300 words). • An up to date artist / filmmaker CV. • Vimeo / online screener links to examples of your moving image work. • A still image that represents yourself. • A still image that represents your work. • Contact details of two referees. All offers of a place are conditional upon receiving satisfactory references. Your referees will not be contacted until after you have been offered and have accepted a place. Your referees will then be asked to provide a character reference on your suitability for this kind of group residency experience. 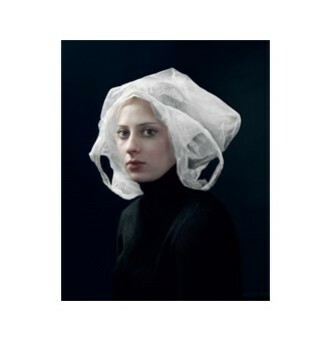 The next upcoming group show is all about plastic bags. ‘OH! PLASTIC SACK’ the show curated by Susanna Kumschick und Ida Marie Corell is travelling from Winterthur to Lausanne. This time the MUDAC will be taken over by plastic bags. This time a museum rather than the natural environment will be filled with plastic. This time I will be in ‘good’ company with plenty other bags! ART, CRAFT and STYLE bind with POETRY are the main ingredients of these two Berliner designer: LINN ANNEN and CONNIE KRAUS. “I am dealing with different forms of expressions on the border between fashion and art. The basic idea of my work is to wear art on the body. I create so-called ”wearable objects” composed of different materials, colors and shapes. A combination of new and used materials, parts of garments, and fabrics is part of my style. “Word-robes“ are clothes, which become an area for the projection of my thoughts. I like to turn the inside out and to use the fashion surface as a medium for personal text fragments and aphorisms. A special way of handwriting done with sewing machine is characteristic feature of my work”. “Mohnlicht is a young Berlin label for interior decoration and living room accessories. We design and manufacture products with elements made ​​of transparent plastic in which natural materials are incorporated. 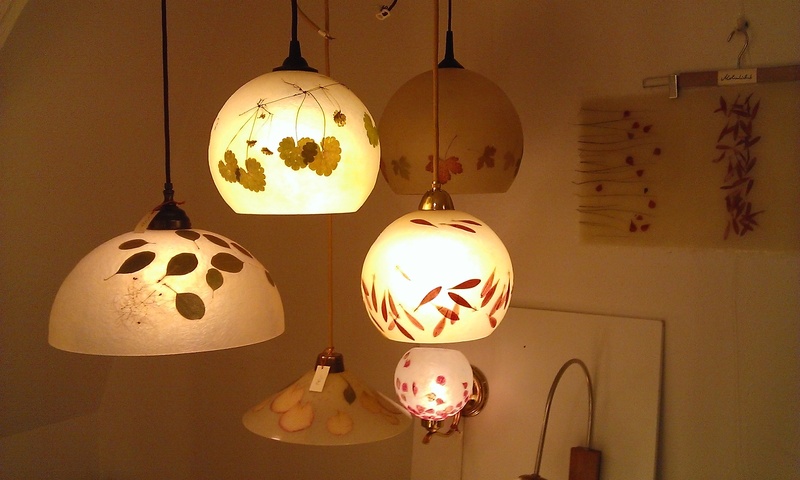 Each piece is handmade, has high standards to the design and is absolutely unique. We offer finished products for immediate purchase but also customize according to wish, measure or interiors to create original and individual pieces. 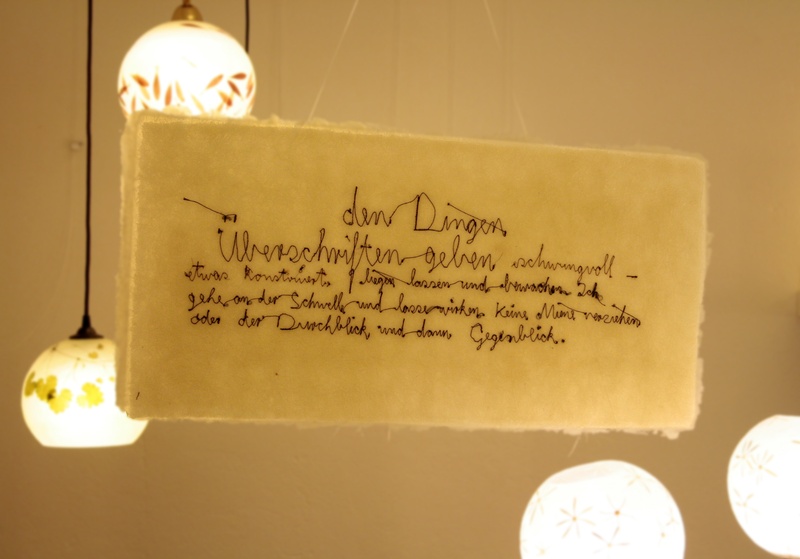 Mohnlicht takes regularly part to art and culture festivals, such as 48 hours of Neukölln”.